Click on the Start button in the bottom-left corner of your screen, then point at Programs, then point at Insofta Document Backup and then click on the Document Backup item. Document Backup appears as a typical Windows application with intuitively clear user interface. All the commands available in the program are available through the menu. The toolbar at the top will allow you to access the most frequently used commands. The taskbar on the left of the program’s window will provide you the quick access to the typical tasks that the program can perform. You can protect the main window from unauthorized access by setting an access password. Setting up a password will not prevent you from being able to backup the items you have configured. This is a handy tool to prevent unauthorized users from changing the program’s settings. When Document Backup starts, it places its icon in the system notification area (tray). Open Insofta Document Backup – opens the program’s main window. 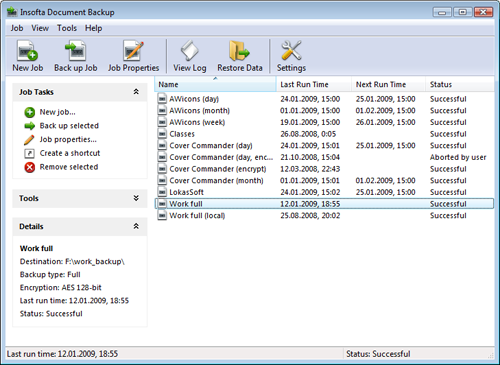 Back up the Item – performs the backup of the selected item. Back up All Items – backs up all items. Exit – closes the program’s windows and unloads the program. To run any of these commands, right-click on the program’s icon in the system tray and then select the command to be run on the list that appears. You can customize the tray icon menu in the Settings window, which can be opened by clicking on the Settings button on the toolbar or by selecting the Settings item on the File menu. Simply select the Exit item on the File menu or right-click on the program’s icon in the system tray and then select the Exit command on the list that appears. You can also click on the X (Close) button in the upper-right corner of the program’s window to close the window. However, clicking on the Close will not actually close the program; instead, it will minimize it to the system notification area.